you are here: :Home - ACP, Discount Offer, PMI Certifications, PMP Exam Simulator - PMI-ACP® – become a certified Agile Practitioner with that ULTIMATE prep tool bundle – 30$ OFF! Only short time left! Exclusive Offer – only this Month, act now! : Get the most popular “Agile PrepCast Elite” – the Agile PrepCast PLUS the Agile Exam Simulator at a special price! This bundle here is probably the best combination of prep material you can get to assure your exam success within short time! Do not hesitate to secure your package now at this special price till Oct, 31st! Act now! Register Now using this Button and save 30$! - No Code required! 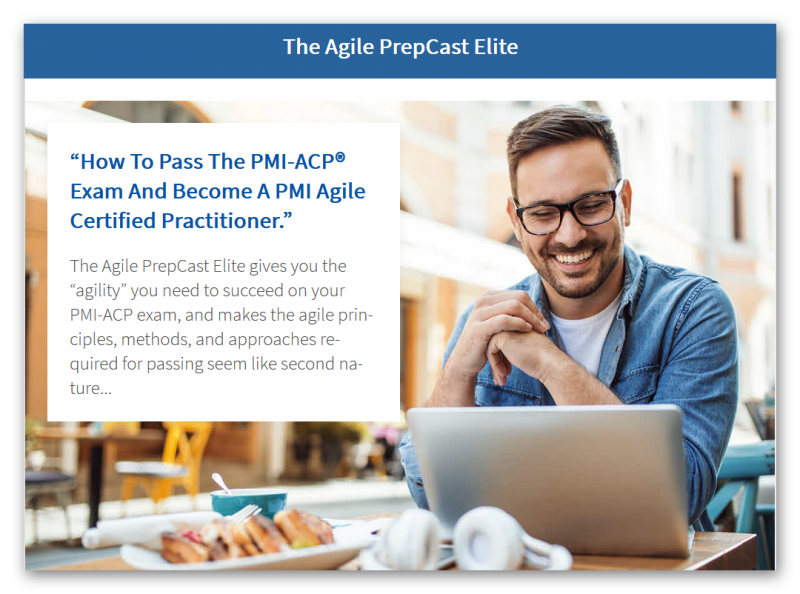 Learn by watching video-based training to master the Knowledge, Tasks, and Skills that are not taught in regular agile project management classes… but which you’d better know if you want to pass the PMI Agile Certified Practitioner (PMI-ACP)® exam. Re-Imagined to Ensure You’re Ahead on Exam Day. The Agile PrepCast was designed and built using an Agile mindset but without ever losing sight of the current exam specifications. Get over one-hundred exam-relevant video lessons with the course. Achieve the deep conceptual understanding of agile tools, techniques, knowledge, and skills, that is required for the exam. Skip Reading The 12 PMI-Recommended Reference Books because we’ve done it for you and digested them into our video lessons. Unlike other “online courses”, this is NOT rehashed classroom training – it’s designed with exam focus as an online course to get you studying exam concepts as much as possible from day 1. We’ve done the reading so you don’t have to. Download All Lessons to Your Phone or Tablet. As an agile project manager, you are always on the go and need to be able to use every available minute to study. That’s not a problem because The Agile PrepCast is a full-featured podcast: Just install a podcast app on your phone and then download every single video lesson right into your pocket! The Agile PrepCast comes with 5+ additional bonus items that are designed to help you plan and start your exam studies in the right way and keep you motivated with success in mind.Certificate for 21 Contact Hours. After completing the course material, you’re eligible to take our Final Exam. Once you pass the quiz, you’ll receive a Certificate that satisfies the PMI requirement for 21 Contact Hours of training in agile practices. But more than that, you are now also a better project manager. Anytime. Anywhere. Even on Your Phone! Get ready for your PMI-ACP® Exam and feel one hundred percent confident to pass: use The PMI-ACP® Exam Simulator. Test yourself on 4 simulated PMI-ACP Exams. That’s a total of 480 realistic PMI-ACP exam sample questions. The questions have been developed by a team of certified project managers who have modeled the format, style and difficulty closely to the questions that they have themselves encountered on the exam. So you can be sure that the questions are indeed what you can expect to find on your actual exam. Additionally, the questions are also modeled against the PMI-ACP Examination Content Outline, which defines the seven Domains on the PMI-ACP Exam on which you will be tested.